This is Fashion Revolution Week and Monday marked the fourth anniversary of the building collapse at Rana Plaza. Since 2013, the issue of ethical clothing has moved closer to the forefront of the fashion world, and many brands have taken steps to become more transparent in their supply chains. Consumers have become more educated, too, and things have started to change for the better. But there’s more work to be done. This year, I’m celebrating my favorite ethical pieces with a little love letter, of sorts. Some of my fellow Ethical Writers are also participating, and I’ll link to their blogs below. Fashion Revolution asks participants to love our clothes more and longer, in an effort to reduce consumption and waste. My most favorite ethical pieces were purchased in 2013, after the events at Rana Plaza opened my eyes to the bigger issues of the fashion world. Some of my first purchases were from Mata Traders, which employs fairly-paid female workers in India and Nepal, and I still wear them frequently through the hottest months in Texas. 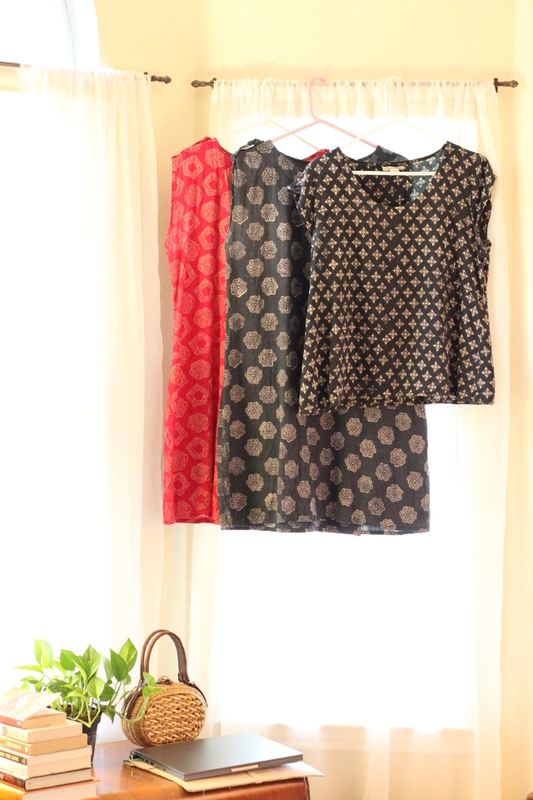 I started with a single black shift patterned with a beautiful handblocked print, and eventually bought a second dress in red. Both dresses are cotton and sleeveless, and the epaulets on the shoulders are my very favorite detail. If you’ve experienced a Texas summer, then you know it’s almost painful to wear clothing in the heat. I always look for the lightest fabrics and easiest silhouettes, because extra details like heavy waistbands and body-hugging styles will only weigh you down and make you sweat. These dresses, along with a blouse in a similar style, are my closet essentials in July and August, and I wear them weekly. I can wash them on the gentle cycle, and if I hang them outside to dry, they are ready to go in an hour or so. It’s wonderful to throw a dress on in the morning and feel ready for the day, and their casual style is perfect for my suburban life of running errands and shuttling my boys to their activities. All three pieces have seen a lot of wear since I purchased them in 2013, and I’ve actually altered each item slightly by removing a few gathered, elasticized seams on the bodices. That way, I’m able to wear a belt with the dresses and blouse and can dress them up a little. And, looking back through my posts, I’ve written about the dresses on five separate occasions, so it’s easy to see how much I love them. While I don’t consider myself very sentimental, I do think I’ll keep these three pieces forever. The fabrics and small details are beautiful, and bringing them out of my closet each year heralds the arrival of another wonderful summer. Do you have a favorite clothing item you’ll never part with? I’d love to hear your love story! FashRev Week: My Fashion Revolution Love Story, from Leah of StyleWise. Fashion Revolution 2017 Love Story: Paris Flea Market Cardigan, from Annie of Terumah. 14 Sustainable and Ethical Fashion Myths That Need to Die, from Alden of EcoCult. I’m Starting a Revolution, from Kasi of The Peahen. Fashion Revolution Week: Where Do I Begin? from Kaméa of Konscious Whispers. My earlier Fashion Revolution posts can be found here.